Two years of rainwater samples collected at the Tudor Hill Marine Atmospheric Observatory enabled a team of researchers from BIOS, Brown University and Princeton University to track sources of nitrogen to the open ocean. They came to the surprising discovery that the ammonium in rainwater came from natural marine sources rather than from human activities in the United States. Ammonium is a form of nitrogen and a common culprit in nutrient pollution due to agricultural practices. Their ammonium source-tracking results are in contrast to the way other pollutants disperse from land to sea, and challenge past assumptions about nitrogen in the marine environment. The study was co-authored by Dr. Andrew Peters of BIOS and published in the journal Global Biogeochemical Cycles. The Tudor Hill facility, run by Dr. Peters, is one of only a few marine atmospheric observatories that exist worldwide. It enables scientists to make year-round, complex measurements of the atmosphere over the ocean without the use of a research ship or buoy mooring. Since the walk-up tower at Tudor Hill was built in 1988, it has hosted many international and collaborative efforts to study how aerosols and gasses are transported over and interact with the ocean. 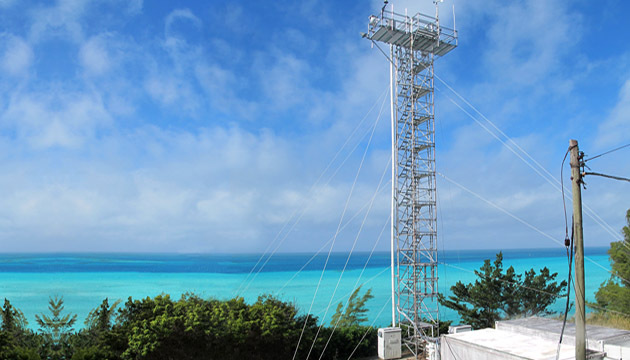 Although strict protocols exist to protect the tower and sensors from the hurricanes and tropical storms that often impact Bermuda, Hurricane Gonzalo’s direct path over the island caused the tower to collapse. Recognizing the devastating setback to such a unique and scientifically valuable source of data, offers of support to help rebuild the tower were quickly forthcoming from the wider scientific community. Happily, plans are being made to have the tower repaired within the next six months.